TOPSoccer... the Game for All Kids! TOPSoccer (The Outreach Program for Soccer) is a community-based training and team placement program for young athletes with special needs. Or visit the Cincinnati TOPSoccer Donation page here. We appreciate your generous donation to make this great event possible! For a glimpse into this event, please watch these videos. Soccer! – Everyone will play two games! 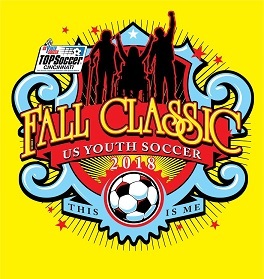 TOPSoccer (The Outreach Program for Soccer) is a national soccer program created to train young people with disabilities in a caring coaching environment. The program is generally carried out by volunteers at the local level, with financial support from US Youth Soccer and the program's local youth soccer organization such as OSYSA. By providing a community-based training and team placement program for young people with disabilities, any boy or girl, age 5 and older, who has a mental or physical disability will have the opportunity to learn and play soccer and become valued and successful members of OSYSA and the US Youth Soccer family. TOPSoccer was designed not as a competitor to the programs run by other sports organizations for people with disabilities, but rather as a complementary program that works hand in hand with organizations like Special Olympics to expand the overall training and competition opportunities for young people with disabilities. The TOPSoccer program often works as a feeder program: recruiting, assessing, and training new soccer players who would benefit from opportunities sponsored by these sports organizations. Many of the sports opportunities currently offered to young people with disabilities are school based. 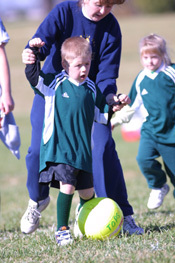 However, many parents of these young people would like their child to participate in the same community sports program as their non-disabled brothers and sisters - to wear the same club uniform, play at the same fields, go to the same awards banquets, and if appropriate, play on a non-disabled team. TOPSoccer can fill this need. The TOPSoccer program has also helped introduce the Unified Soccer Camp in many areas, a concept developed by Special Olympics. The Unified Soccer Camp brings together disabled and non-disabled soccer players in a positive and fun environment, hopefully breaking down social barriers through a common love of the game. A basic TOPSoccer program consists of two vital components. The first is a field site where soccer players with disabilities can receive high-quality training to help develop their soccer skills. Training sessions could include activities such as scrimmages, small-sided games (3 v 3, 4 v 4) and tournaments. 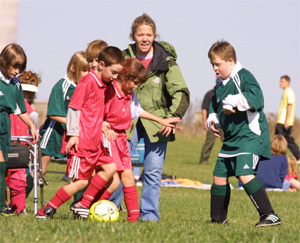 The second component of the TOPSoccer program is an ongoing player assessment process that places participants in the most appropriate playing situation, including placement on non-disabled, intramural and club teams, or involvement in programs established by other sports associations for people with disabilities (i.e., Special Olympics).